Magic was originally a thought. A concept caused by the desire for solid commuications and freedom of publishing. Here grew resources from random catalogs and old junk lying around. It became a monster. Magic is a 486-based system (running Linux, no Microsoft O/S'es here!!) with 16MB RAM, 1GB of disk space and a shared T1 to the internet. It does not have a case, monitor, or keyboard, instead, it hangs from the wall with a fan over the processor. It is actually quite impressive in sight and when pictures become available, they will just dazzle you with its weirdness. 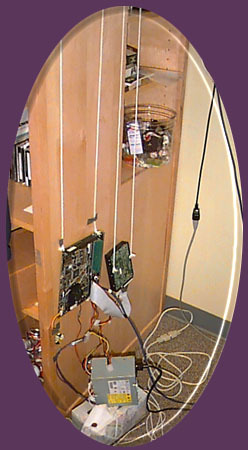 Currently, it resides in the dorm room of super programmer Chris Lattner where is is near its hurrah buddy Orbital. Magic was created to learn system administration skills by providing a system with users with real-life problems and require prompt solutions. Originally was used as a small network computer in some big company. Then was sold for some cheap price to Halted Specialties Co. where it was sold without hard drive and RAM for $100 to James Neal. Came to Geekfest 96 working perfectly, had a modem plugged in and then DIED. (30 watt proprietary powersupply couldn't handle the load!) Right afterwards, James got shocked by the mad capacitors screaming their last volty words. Was resurrected through a combination of cabling, deductive reasoning, and creativity. The connector from the proprietary power supply was taken off and was cabled up with a standard PS connector. Chris' old 170MB drive was donated to the effort, so was 16MB of RAM from James. Ryan had a fun time of figuring out how it was going to be mounted and arranged. For $2.00, we got an advanced power supply that the retailer thought was broken. A creative paper clip fixes the powersupplies problem. It still has the sticker that says "scrap" on it. Now is hooked up to Ryan's funHUB and hangs precariously off of a wall in Chris' room, where it is happy.